A new £12m retail park is opening its doors, creating 250 jobs in the area. Some of the stores at the Snowhill Retail Park, to the north of the city, welcomed their first customers this week. The development, by Kier and Savills, includes an Aldi supermarket, Iceland Food Warehouse, Greggs, Costa, McDonald’s, Poundworld, Subway and Barnardo’s, as well as two other retail units. Dan Hyde, senior development manager at Kier Property said: “We’re really pleased with the progress of Snowhill Retail Park, which is going to be an important asset to the local area. “As more retailers open their doors between now and the park’s official opening this summer, the development will contribute to the wider regeneration of the area, attracting investment and creating jobs. 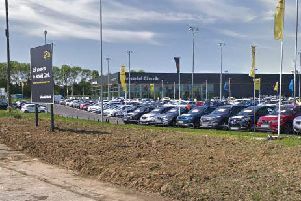 The retail park forms the first phase of the wider Snowhill development, along the A650 in Newton Bar, which received planning permission in 2009. Up to 1,200 homes and 57,818sq metres of employment space are planned for the site, as well as leisure and community facilities. Coun Denise Jeffery, Wakefield Council’s cabinet member for economic growth and skills, welcomed the completion of phase one. She said: “It’s great news that the Snowhill Retail Park is opening. Coun David Dews, who represents the Wrenthorpe and Outwood West ward, added: “Anything that brings jobs to the area is going to be a good thing and local people will benefit from shops being available on their doorstep without having to go into the city centre. “However, there have been comments about the loss of green fields and concerns about highway congestion in the area. A McDonald’s restuarant, creating 100 jobs, and a Greggs outlet, which is also recruiting for new roles, were among the new units to open this week. The development also includes more than 200 car parking spaces.